Weight loss: Edamame has high protein and low fat levels in it. This is resulting with less hunger between meals and there is big amount of weight loss. One cup of cooked beans contains 17 grams of proteins which is 30% of the required amount intake for men and 31% required protein intake for women. One cup of cooked beans also contains 8 grams of fat and less than 1 gram saturated fat. Bones: One cup of cooked soybeans contains 1.6 milligrams of manganese which is over half of the recommended daily intake for adults. This element is needed for your bones to be strong. 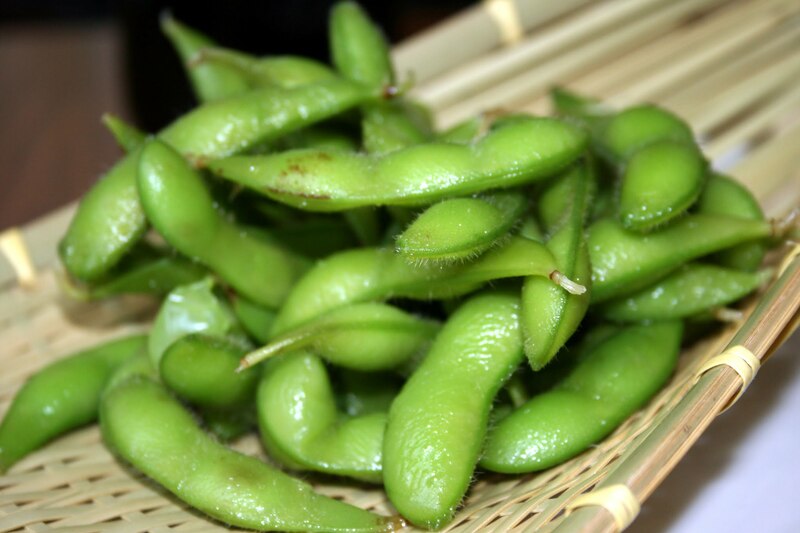 Also the edamame contains 20% of Vitamin K which is vital for increasing bone density. Soybeans is also high in magnesium and potassium which are supplying at least 10% of the both minerals needed for the adults for their daily intake. Immune system: Copper which is contained in the soybeans is needed for your immune system to be healthy and to function properly. Adults need 900 micrograms of copper per day. One cooked cup of edamame contains 535 micrograms which is 60% of the required daily amount for men and women. 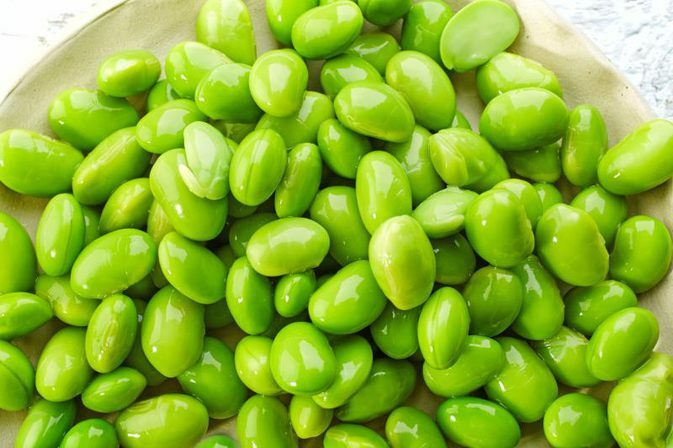 Edamame is rich with genistein and daidizein which mimic the behavior of the estrogen in the organism. These elements can lower the risk for having cancer. Cardiovascular benefits: In every cooked cup there are 8 grams of fiber. This is 23% of the recommended daily intake for men and 28% for the women. If you are consuming food which is rich with fiber, then you are decreasing the chances to have heart diseases. Soybeans has high concentration of AHA which is an omega-3 fatty acid. Your body is converting the AHA in EPA and DHA. These compounds are decreasing the risk of stroke and heart diseases and are lowering the blood pressure. Age-related brain diseases: Many studies have shown that people which are consuming edamame in large amounts are having less chance to get age-related mental disorders. Breast and prostate cancer: The amount you intake from soybeans can decrease the risk from breast and prostate cancer. 10 milligrams of edamame per day would decrease the risk to breast cancer for 25%. Depression: Edamame contain folate that can help against the depression. This is possible because edamame prevents from homocysteine that can prevent blood and nutrients to reach your brain. This is reason to be produced feel-good hormones such as dopamine, norepinephrine and serotonin which are improving the mood, increasing the good sleep and appetite. Diabetes: People which are suffering from type 2 diabetes are willing to have kidney disease, because is extracting big amount of protein in the urine. Many cases have shown that people with this disease should eat soybeans because is decreasing the amount of the protein that is extracted in the urine. Energy levels: Soybeans is great source of iron which is vital for the energy. Osteoporosis: This plant is decreasing the bone loss and is increasing the bone minerals. For women is good be known that when they are in their menopause they should eat edamame because is reducing all menopausal symptoms. Better lung function: Patients which are having asthma should eat lot of soybeans because this plant contains geinstein which is improving the lung function. Inflammation: Choline is nutrient in the soybeans which is improving memory, learning, sleep and muscle movement. Also edamame is reducing the chronic inflammation.